art inspires me so very much. 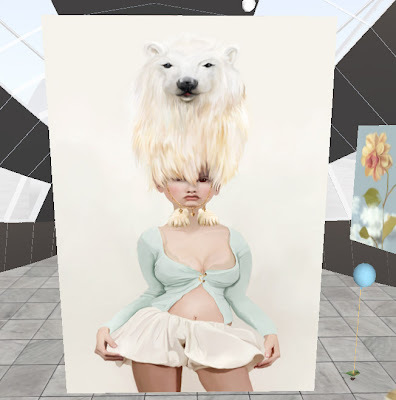 A commercial/graphic artist from Amsterdam, she has been gracing SL with her extraordinary freebies. When I say freebies I mean her art which she shares for free, allowing the viewer to interact, participate, collaborate and become her work (more about that here). I attended her opening at Wyatt Benoir's ARTist's Park. Here she features portraits - avatars rendered in broad brush strokes. The works are whimsical and curious, each holding a detail that made me quiver, laugh and sigh with happiness. Look for the lush attention to fleshy creases - a bit like John Currin coupled with a Jenny Saville attention to creases, but never bleak. On the contrary - the portraits, and their monumental presentation in the gallery - are bright and fun. The portraits capture a flushed tangibility through a Vogue stylist's eye - a stylist drinking a proper herb filled Pimm's .